Two composers are dividing the sound space of this album: the Cuban Leo Brouwer, born in 1939 in Havana, and the Brazilian Egberto Gismonti, born in 1947 in Carmo, in the state of Rio de Janeiro. Everything brings these two personalities closer to an artistic production beginning with an exemplary opening where popular music and serious music conjugate with intelligence and talent, and where the guitar occupies a significant place. Brouwer dedicates more than about sixty compositions to the instrument including numerous concertos, whereas Gismonti creates new sounds on a guitar endowed with additional strings and with a special tuning which confers on his playing and on his music an exceptional character. By the end of the 70’s, Brouwer turns away from the avant-garde movement to which he was subscribing for a while and adopts a simple language, nourished by classical music and popular accents, like in his Toccata for guitar quartet. The four guitars shout at each other, answer, imitate, complement each other and join vividly; the result is strong, tonic. Acerca del cielo, el aire y la sonrisa dates from the same period. This composition in two parts is originally conceived for four guitar ensembles reduced here to a guitar quartet. In the first part of the piece - written in a minimalist language - sound climates follow one another, one more surprising than the other, whereas the second part, Fantasia de los ecos, more classical, does not disdain humoristic situations. Brouwer places, conveniently, a quotation of the song of Roland de Lassus “O la, o che bon eccho”. A manuscript dating 1984 testifies to it, Cuban Landscape with Rain was entitled Serenata de Castres before becoming the first one of a set of Cuban landscapes that Leo Brouwer composes in the course of years (Cuban Landscape with Rumba, 1985 - Paisaje Cubano con Campanas, 1987 - Paisaje Cubano con Tristeza, 1996 and Paisaje cubano con fiesta, 2008). The evocation of the rain begins in this piece with delicate drops of water falling sparsely at first, then more abundantly until it is transformed into a real shower preceding the return to a state of calm. The electronic version of this Cuban Landscape with Rain realized by Lucio Matarazzo for this recording stresses the descriptive effects of Brouwer’s composition and confers an impressive scale on the evocation of cloudbursts. 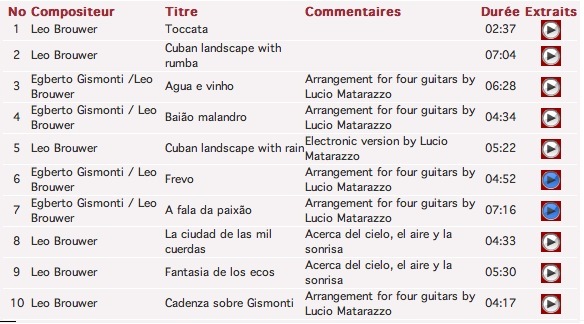 For the execution of his Cuban Landscape with Rumba, Leo Brouwer recommends the use of prepared guitars in the first part of the piece, meaning the modification of the timbre of the instruments by means of several accessories. The GuitArt Quartet chose to use pieces of tissue which, placed under the strings at diverse places, modify the color of the sound of the four guitars without altering their tuning. Sixteen years pass by before the Cuban composer demonstrates again an interest in the guitar quartet. In 2001, Brouwer dedicates his Concierto italico for four guitars and string orchestra to the GuitArt Quartet who premiered it under his direction in Todi. Ancient Italy is evoked in three movements entitled Las predicciones de Italo Calvino, La nostalgia de d’Annunzio and Villanella napoletana. The genre is familiar to the four Italian guitarists, Angelo Gilardino already composed for them his Concerto Italiano, premiered in 1999, and Gerard Drozd dedicates to them, two years later, his Concerto rapsodico opus 80 for four guitars and orchestra played for the first time at the Lublino Festival, in Poland. The success of the Concierto italico, played over 70 times in Europe, in the USA and in South America, inspires GuitArt Quartet to request a new concerto. The artists’ wish is a concerto of Brazilian influence. The idea of the composer is to repeat the experience of From Yesterday to Penny Lane based on the arrangement for guitar and string orchestra of seven songs by the Beatles. All of them being unconditional admirers of the music of Egberto Gismonti, the future Concerto brasileiro turns without hesitation to the universe of the Brazilian jazzman. 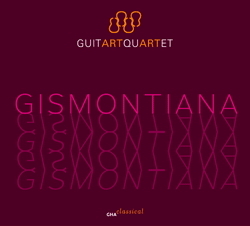 The work rises in five themes by Gismonti, four of them being already well known in the guitar world thanks to the Assad’s stunning versions for duo guitar. Brouwer concludes his arrangement in five movements with a Cadenza sobre Gismonti: the soul mates of the Cuban and the Brazilian join in a summary bubbling with imagination in which the themes - in the middle of which skips furtively that of Sete anéis* - are evoked in a fleeting and brilliant way. Since the idea of a concerto is quite far along now, Brouwer subscribes to the custom consisting of using the name of the person to whom tribute is being paid as the base of the title, in this case: Gismontiana. A fascinating alloy of rigor and of romanticism, the music of Gismonti oscillates between rhythm so complex and creative, and a melodic expression, the power of which has an equal only in its sincere simplicity. The musician, stemming from an Italian-Arabic family established in Brazil, develops a strong personality, the fruit of these direct influences. The Frevo and the Baião malandro testify to his Brazilian roots, whereas the Italian lyric is underlying in Agua e vinho and A fala da paixão. Before they premiere the work with the Tartini String Orchestra at the Teatro Carafo, in Latina, in 2008, GuitArt Quartet presents at the Cordoba Guitar Festival, in 2005, an adaptation for guitar quartet of this Gismontiana made by Lucio Matarazzo (with the exception of the movement entitled Loro whose writing does not fit so well with a version for four guitars). This version played many times in concert matches harmoniously with Brouwer’s composition for guitar quartet presented in this recording. *composition by Gismonti written at the occasion of an exhibitition of Brazilian sculptor Antonio Peticov, in 1986, in Rio de Janeiro. Un po' in ritardo ... ma grazie moltissimo!!! Il CD sta avendo un successo strepitoso in tutto il mondo, tant'è che il grande chitarrista uruguayano Eduardo Fernandez ne ha fatto anche una bellissima recensione, tra l'altro pubblicata anche su "Il Fronimo" in Italia! Chi fosse interessato può leggerne il PDF. I miei più sinceri complimenti. Me lo procurerò al più presto.